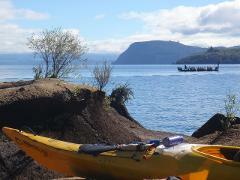 In one day, you will enjoy a leisurely 2-2.5 hour mountain-bike ride, and 4 hours kayaking on the crystal clear waters of Lake Taupo. You will meet us at our base in Acacia Bay, where we will load your bike then set off by road to Kinloch, to ride W2K (Kinloch to Whakaipo Bay) section of the Great Lake Trail. Starting at the Kinloch Domain, follow the markers around the marina and along the waterfront and then up a gully to Boojum Dell. The trail climbs steadily up through native bush and onto the headland, providing great views across the lake and back down into Kinloch. At the junction of the Headland Loop there is a toilet and a map. 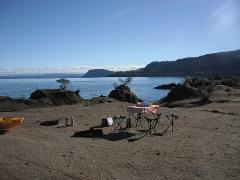 From here you continue to ride down the undulating pumice trail through native bush towards Whakaipo Bay. There was no major importing of gravel into this track, the surface it just the way a real mountain bike track should be. Looping around some contours on the hillsides there are excellent views of the Lake and the Tongariro National Park to the south. Along the Great Lake Trail listen for native birds and wind in the bushes at one of the nice viewpoints. There are some great fast flowing sections on this part of the trail. At the end of the track you will ride through the farmland, past paddocks of sheep and down towards Whakaipo Bay which is one of the last untouched public and farmed reserves left on the shores of Lake Taupo. This place is so rustic and raw, you will be speechless. It will here at Whakaipo Bay where your gourmet lunch will await you, either on the shores of the lake or amongst the rustic land. After lunch your guide will equip you, so we can set off on our kayaking leg. 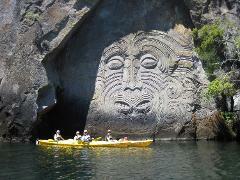 We will pass the historic Maori rock carvings at Mine Bay, be captivated by these striking carvings as your experienced guide will explain the carving's cultural significance to the lake and surrounding areas while you float beneath them. Paddle below native bush, past steep cliffs and mini inlets as we paddle back to base as watching the crystal clear water as it unveils. This trip can be run in the opposite direction too. A good climb still for less experienced or less fit riders that rewards you with everything you could want from a ride; great views, fast and flowing downhills and a workout! 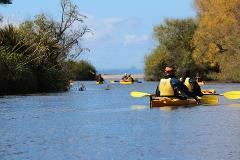 Transport: On request only (if you do not have your own transport) – Pick up from/to Taupo CBD. Please call or email to arrange.